Home > Heavy Duty V Belts > Moulded Notch V-Belts. AX, BX, CX, 3VX and 5VX Sections. > AX Series. 1/2" Wide Molded Notch V-Belts > Classical AX120 Industrial V-Belt. > A120-KC Ultrapower V-Belt. Kevlar Wrap A120 Industrial V-Belt. A120-KC Ultrapower V-Belt. Kevlar Wrap A120 Industrial V-Belt. 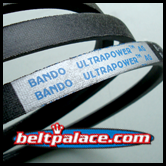 A120KC BANDO ULTRAPOWER AG Belt. Kevlar Wrap A120 Industrial V-Belt. A Section = 1/2” Wide, 122” Length OC (3099mm). Features superior “clutching” Kevlar/Aramid fiber cover for high durability and extra long service life. Heat and oil resistant. NAPA-Sunbelt, Grainger, Ametric (low grade) A120K. AX120 V-Belt. Classical AX120 Industrial COGGED V-Belt. 1/2" Wide, 122” Length OC (3099mm). 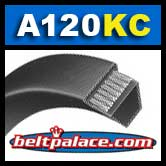 Replaces Standard Raw edge A120, 4L1220 FHP V-Belts.